Leeks, Bacon, and Mushrooms are a combination possibly designed in heaven, they are such a match and hard to equal. So, it comes as no surprise that the classic combination makes an appearance in one an important piece of literature written in 1950's Britain - The Fellowship of the Ring by J R R Tolkien. This is how Tolkien introduces the three to the reader. "One to two other hobbits belonging to the farm-household came in. In a short while fourteen sat down to eat. There was beer in plenty, and a mighty dish of mushrooms and bacon, besides much other solid farmhouse fare. The dogs lay by the fire and gnawed rinds and cracked bones." In what form they exactly appear isn't made clear but back in those times, most likely as a tart or pie (both loved in Britain at that time) and perfect for a Hobbit to take with them on their travels. 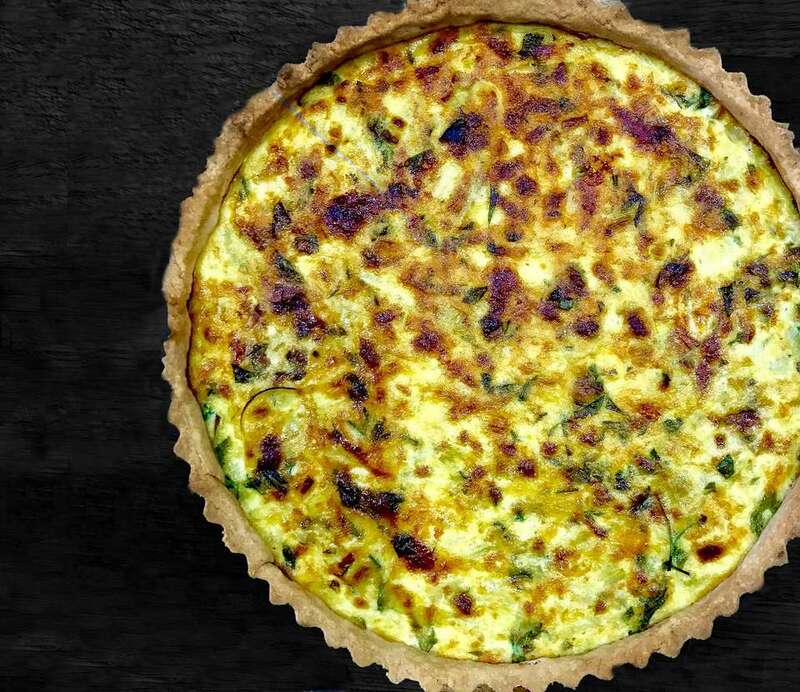 This tart is a modern take on the tarts and pies of the time and in its current incarnation is a great lunch dish, packs into a picnic, lunchbox or a tea time treat. Roll the pastry to 1/4" thickness and line a greased 9 3/4 in. loose-bottomed tart tin. Once ready, pop the tart into the fridge to chill right down and for the pastry to rest. If you omit this stage, the pastry will shrink while it is cooking, you have been warned. Make the filling, first by melting the butter in a large frying pan. Add the finely chopped leeks and cook until softened but not browned. Once soft, place to one side to cool. In the same pan, add the oil, bring to medium heat and briefly fry the bacon or pancetta lardons, again until just soft but not brown. Remove them from the pan and again, put to one side to cool. Once more, into the same pan, add the finely chopped mushrooms and cook briefly to release any liquid. Lift from the pan and place onto kitchen towel to drain. Put the eggs into a large measuring jug. Add the cooled leeks, the bacon, the mushrooms, the grated cheese, the parsley and top up with the milk until the contents of the jug measure 24fl oz. Season with a little salt and black pepper. Bake for 30 - 40 minutes until the top is golden brown color, and still slightly wobbly in the center. If you find the top is cooking too quickly and browning before the egg is set, lay a sheet of aluminum foil over the surface to protect the top from burning. Remove from the oven and rest for five minutes before serving. The tart is lovely warm but can also be eaten cold. Meals and Mealtimes in Britain - What Are They Called?